If you could change history, would you? College graduate Josephine “Josie” Jackson answers ‘yes’ to the question on a survey while visiting an Old West tourist trap. The next morning, she wakes up in Indian Territory in the 1840s, where she’s given a mission to complete before she can return to her time: to reset history by finding and stopping the man responsible for a horrific massacre. It seems easy enough, until she discovers that three other women have been sent back to the same time period. When Josie uncovers what happened to them, she realizes the chances of her getting out of the past alive are not good. To survive, she’ll have to trust the very man she’s there to stop, someone who has every reason to distrust her and only one reason to help her – to prove he’s not the monster she claims he’ll become. I think that this is the first time travel novel I’ve ever heard/read (I maybe unfairly discounting The Timetraveller’s Wife because the timeline was so short) and it’s broadened my horizons considerably! My concern was that I’d find the time travel aspect a little bit too silly and it would spoil the story for me – not the case. It’s consistent and not too technical, what the main character does after time traveling is what counts, not how she got there. This is the first book in the History Interrupted series, if the rest is anything like this one then I’ll definitely be finishing the entire series! That said, I think I’m going to wait until they’re all available in audiobook format to enjoy them. Lillian Yves (disclosure – she’s one of my favourite narrators of all time) is the perfect voice for the character of Josie Jackson (more on her in a sec) and brought so much to this story, she actually had me crying at one scene which isn’t something I’ve ever done before where audiobooks are concerned. Josie Jackson gets sent back in time in a suitably sci-fi manner and has to do her best to fit in to her new surroundings and solve a mystery. She’s a very sweet character, incredibly empathetic and kind to a fault – she’s very quick to trust others and is a little naive, which makes you worry for her that people will be quick to take advantage while at the same time you appreciate her humanity. She may be very much in touch with her emotions but she knows how to get things done and singlemindedly gets what she wants – watching her approach the studmuffin of this novel was beautiful. The setting of this book is glorious, I really feel that Ford understands the lines between describing a setting and letting the reader’s imagination do the rest of the work – I think we’re all familiar enough with the Old West setting to conjure up some brilliant images. Ford really takes advantage of that and uses it to build a really original and suspenseful mystery, then abuse your emotions like some kind of evil overlord. Wow. This author understands how to make you care about things, and then manipulate them until you’re a crying mess and have to pull up in a B&Q carpark until you’ve composed yourself, ready to tell any passers by that ‘it’s just hayfever’. I mean, hypothetically. If you’re in to that kind of thing. 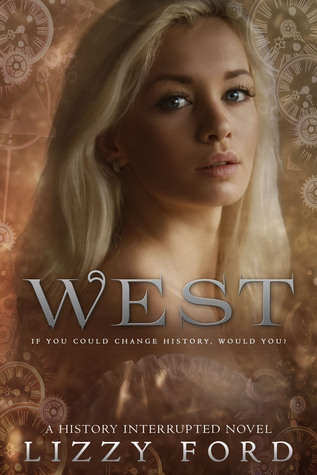 This is a book I’d recommend to fans of urban fantasy, Doctor Who, anything with a strong female lead or basically…. a fan of books with murders and smooching.